Pinellas county commissioners voted Tuesday to put the light rail referendum on the 2014 ballot and the Tampa Bay Times reported that commissioner and PSTA Vice Chair Ken Welch got irked with opponents of the 14% sales tax increase who showed up to make a public comment. Commissioner Ken Welch said he was irked by some of the misrepresentations and accusations of corruption leveled by some of the opponents. The issue, Welch said, is one of the most important voters will ever make and the debate should be based on facts and not misinformation. We agree that any debate should be based on facts and not misinformation. So why isn't Commissioner Welch taking to task those who continue to falsely repeat the Pinellas rail plan includes a train going over the Howard Frankland bridge? Does he not consider that misinformation? The Greenlight Plan is a complicated (emphasis ours) network of buses, trolleys and light rail connecting the entire county. The cost for building the rail, adding vehicles, and operating the network is $20 billion through 2050. The money would greatly expand the current bus system, with new equipment, routes, and hours of operation. Later, a light rail system will be put in place to take riders from downtown Clearwater to downtown St. Petersburg. There will also be a light rail connection to downtown Tampa (emphasis ours). The Tampa Tribune also reported on the Pinellas commission vote and stated not only does the Pinellas rail plan go across the bridge, it goes to the airport. The plan also includes a link to both Tampa and Tampa International Airport, likely through light rail across Howard Frankland Bridge. There are also plans to connect to Tampa when the Howard Frankland Bridge is replaced around 2025. Whatever powerbroker collaborated handing out the talking points to the local media, they got it dead wrong on the bridge. Taxpayers should beware because even the ballot language the commissioners approved to put on the ballot is misleading and includes NO accountability requirements or financial impact information. Title: Levy of Countywide One Percent Sales Surtax to FundGreenlight Pinellas Plan for Public Transit. Summary: Shall the improvement, construction, operation, maintenance and financing of public transit benefitting Pinellas County, including an expanded bus system with bus rapid transit, increased frequency and extended hours, local passenger rail and regional connections be funded by levying a one percent sales surtax from January 1, 2016, until repealed, with proceeds initially deposited in a dedicated trust fund? The only regional connection falsely represented on PSTA/Greenlight Pinellas map is going over the Howard Frankland bridge. Commissioner Welch - Talk about misinformation - these statements are absolutely false. PSTA/Greenlight Pinellas's own documentation cannot even consistently state what their own plan is. Passenger rail or rail or whatever rail they state, rail in this plan is light rail and we all know it. PSTA/Greenlight Pinellas's documentation as well as the referendum ballot language should clearly state that "fact". And nowhere in this plan are any costs associated with going over the Howard Frankland bridge. 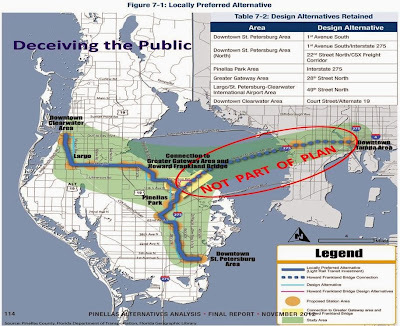 Again PSTA/Greenlight Pinellas's own documentation is misleading but we updated their map to clearly reflect there is no train over the bridge in their plan. State and federal money would be used for the new span if the bridge is replaced with one the same as today’s, but if other features are incorporated, FDOT could ask local entities to come to the table (emphasis ours), District 7 spokeswoman Kris Carson said over the summer. Florida Department of Transportation Secretary Secretary Ananth Prasad said the state is committed to building an estimated $25 million substructure to accommodate light rail on the replacement span of the Howard Frankland bridge. FDOT project work plan just came out that includes strengthening the substructure to accommodate light rail or less in the future. First phase will focus on replacement and later phases on managed toll lanes and/or transition to transit/rail corridor. But the fact is there is no current plan nor funding source for a train across the bridge. As the Eye previously reported, the numbers for the PSTA/Greenlight Pinelas plan do no begin to add up or make fiscal sense. But rail across the bridge is fairy dust and unicorns. City leaders approved the plan which, with a one cent sales tax, will fund a future public transit rail line, among other things. "We'll have 11 months for a campaign (emphasis ours) to go out and reach the voters and talk about this project," Danner added. Greenlight Pinellas is funded by taxpayer funded PSTA and is really PSTA's symbiotic taxpayer funded sister. In this WFLA video, taxpayer funded PSTA CEO Brad Miller is wearing a PSTA/Greenlight Pinellas campaign button. The ballot initiative will likely be promoted by a local PR firm, Tucker Hall. What a convoluted mess to deceive taxpayers. PSTA/Greenlight Pinellas are one and the same. Wearing campaign buttons and handing them out with other campaign goodies at taxpayer expense is not education, it's advocacy. It is unethical and corrupt and taxpayers in Pinellas should demand that Greenlight Pinellas cease, desist and immediately be defunded. The PSTA/Greenlight Pinellas financial plan includes light rail capital funds totaling almost $2.6 Billion. The light rail capital costs as we stated above are $1.68 billion. We've asked the question before - where is that extra billion dollars of capital funds going? To special interests? Does this plan take out lanes of traffic and require huge sums of tax dollars to pay for right of way? Does anyone know? With no accountability specified, who knows where all this money is going. As WFLA reported in the video, this rail boondoggle is complicated and "the biggest part of the puzzle is light rail". Here at the Eye we agree - the PSTA/Greenlight Pinellas plan is a complicated tangle of ambiguity, false statements and unanswered questions. Oh the irony of Commissioner Welch - being irked at opponents of this mess? But someone must believe if false statements keep being repeated, then you will believe it. This is similar to the $1 Billion advance giveaway for a fictitious unlicensed Nuclear Power Plant that was never required to be built and has been removed from Progress Energy, now Duke Energy, agreeing they can take $150 Million annually. Same players in legislation... Bilking the public with B.S.